If it seems like it’s been a while since I last posted . . . it has. 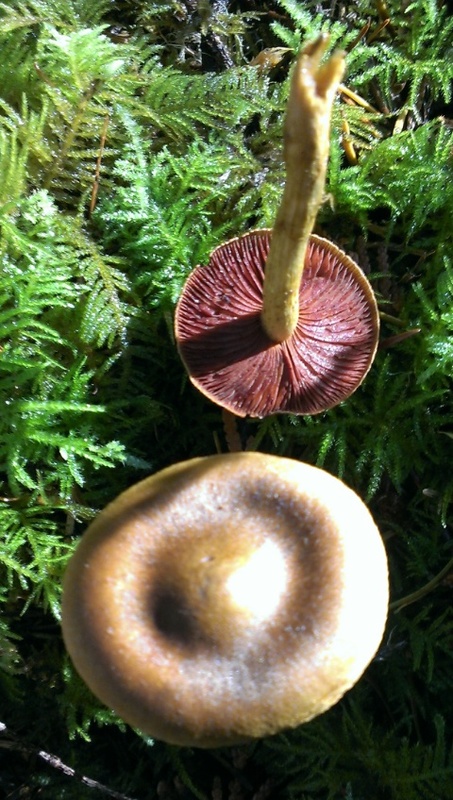 Despite the dry summer, the mushrooms are coming out now, so most days we’re out scouting our favourite spots. We discovered one particular patch of Lobsters (Hypomyces lactifluorum) two years ago and hadn’t been back since, but we decided to check it out this morning. Strangely enough, there were very few other mushrooms around, but our patch didn’t disappoint; we came home with a good ten pounds of the beauties, most of them already breaking apart. But that doesn’t matter to me—I’ll strip the coloured bits no matter how fragile or smelly their hosts might be. 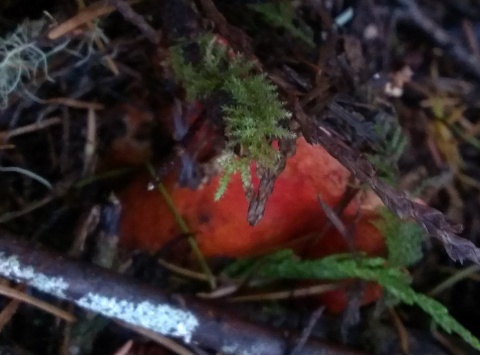 And it was interesting to see the various stages of progression: from an uninfected Russula brevipes to one starting to show a bit of colour, to one in the full stages of orange. This was interesting. 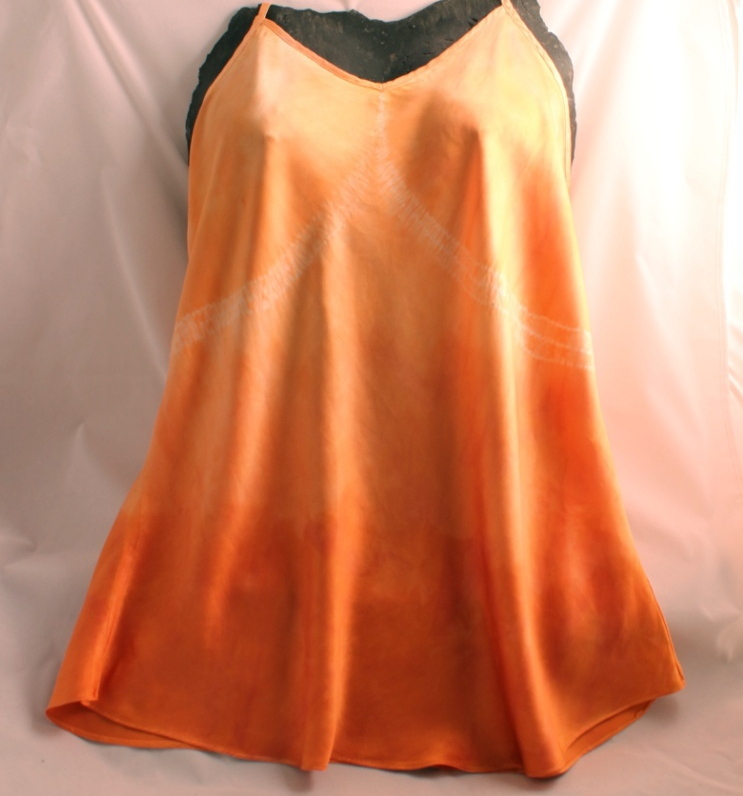 I’d done triple rows of shibori stitching to create a design on the front of this camisole, but the Lobster (Hypomyces lactifluorum) dyebath didn’t give me the vivid red or orange I had hoped for. So I decided to try for graduated colour shifts by letting the bottom half of the camisole sit in the exhaust bath for a couple of days. Then I raised some of it out, leaving the lower part to sit and absorb colour a bit longer. 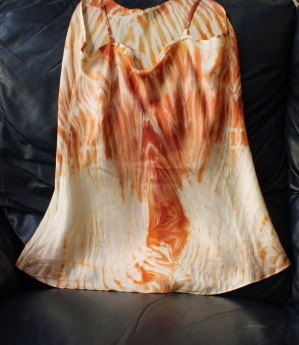 I didn’t heat this up again, but I let the camisole dry without rinsing, then I ironed the whole thing, hoping the heat would help set the colour. 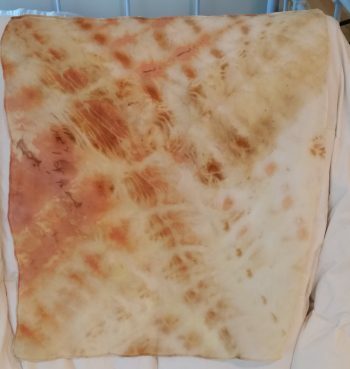 This method seemed to have worked; I rinsed the camisole the following week, and the colour gradations remained. Even though last year’s harvest of Lobster mushrooms (Hypomyces lactifluorum) was bounteous beyond belief, I’ve been careful about using up all the parings. These wonderful fungi could decide to take a year off this autumn, as has happened in the past, and I don’t want to deplete my supply. 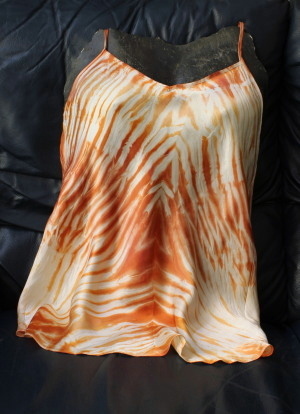 Having had success with the Tiger Camisole, I decided to do something similar with the Lobsters. 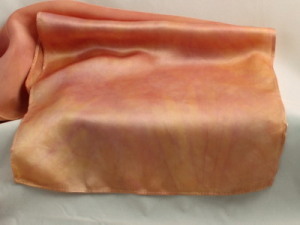 This was interesting: I’d wrapped and tied the silk piece around a stubby glass bottle, which I stood upright in the dyepot. Unbeknownst to me, the bottle had tipped over halfway through the process, leaving a half-dyed part exposed to the air—a happy accident indeed. 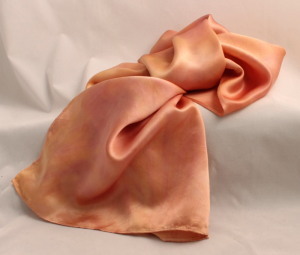 The half-dyed bits were a brilliant orange, while the fabric that remained in the liquid dyed a deep red. I definitely need to play with this characteristic some more (assuming it will happen again). I prefer to be called Mushroom Annie. Alright, then—Mushroom Annie, we’re here today to discuss a matter of serious concern that has come to our attention. Go ahead. But please make it quick. 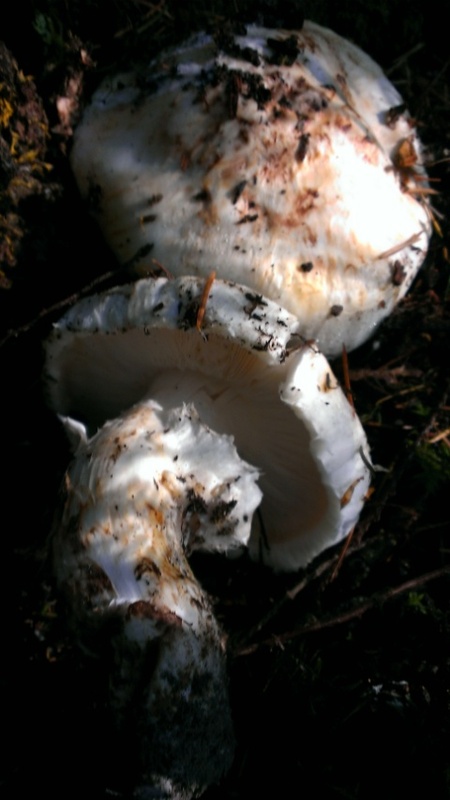 A cold front is coming in next week, signalling the approaching end of mushroom season. Uh, yes . . . I see that you understand already. Your family and friends are worried about you. Your studio floor is covered with drying fungi, your dehydrator is churning out dried fungi, your front steps are littered with all manner of disgusting fungi, yet you persist in going out every day for more mushrooms. Does this not seem a touch worrisome? Not at all. Why should it? Well, for one thing, what about your friends? Are you not concerned that you might be neglecting them? I have friends in my mushroom club, the Sunshine Coast Society for the Hunting, Recognition and Observation of Mushrooms (that’s SHROOM for short). Silas, my dog who accompanies me on all my forays, is my good friend. 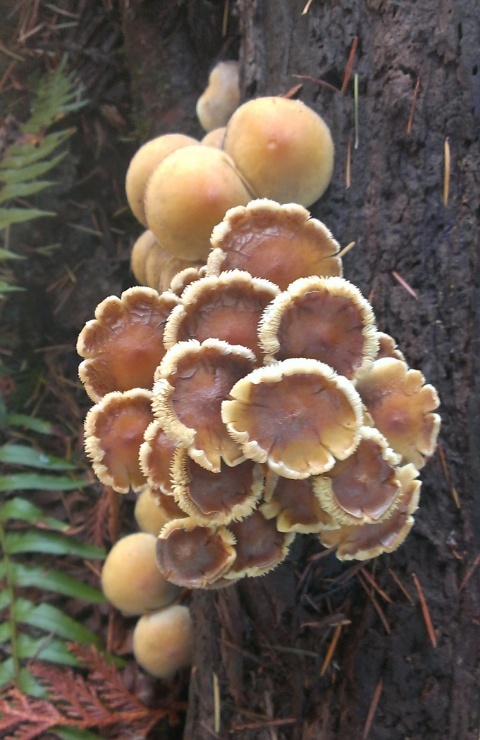 Even the forest fungi are my friends. Listen, Ann . . . I mean Mushroom . . . oh, dammit, you know who I mean! You’re obsessed! You’re living a one-track life! You’ve allowed mushrooms to assume an importance beyond their worth! I’ve learned that you’re not even spinning in the evenings anymore! That time in front of your spinning wheel used to be sacrosanct—can’t you see what’s happening to you? I miss spinning, I really do. 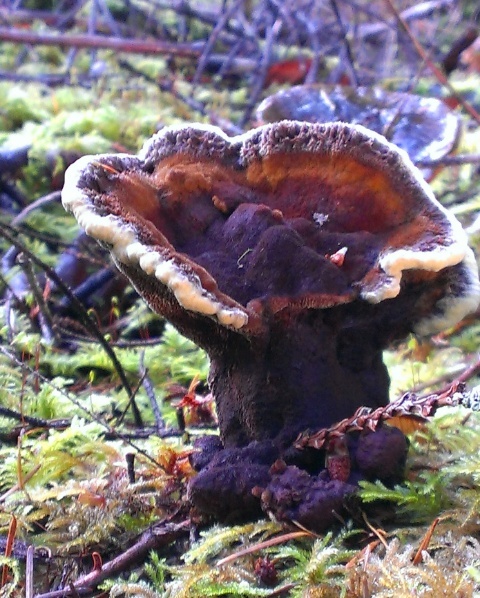 But I keep finding Lobster mushrooms, and people keep giving me more, and they have to be pared before they go rotten. And speaking of Lobsters, I’ve already made concessions. My husband banned me from cooking the parings inside, because it made the house smell like, well, rotten lobsters. That was a major factor in my decision to turn our guest cottage into a mushroom studio. You gave up B&B-ing in favour of mushrooms? This is more dire than I thought. How have you let it come to this? All I can say is . . . well, consider my latest foray into what I call my backyard: acres and acres of forest where Silas and I can hike for hours without any human contact. At the start of the trail was this intriguing photo op—how could I pass it up? And it’s a dyer—a bonus! Once we reached the day’s foraging spot, as I clambered over logs and squeezed under deadfall in search of Dermocybes, I saw this Lobster peeking through the duff, tantalizing me to inspect a bit closer. I picked it, of course, and looked around carefully, only to find five more of these beauties, all ready to offer up their pigment. 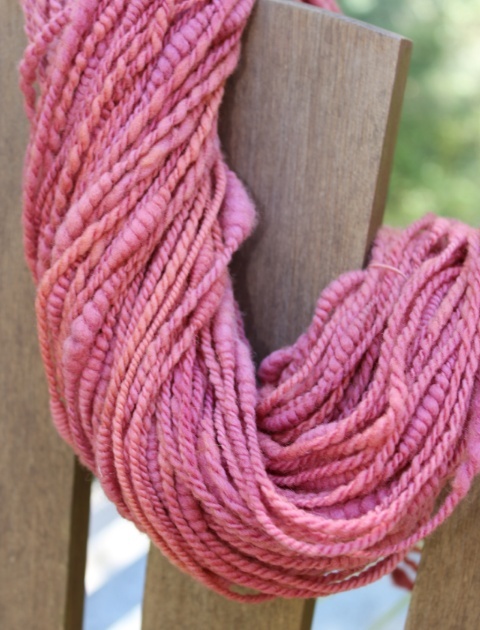 Do you know how hard it is to obtain red from natural dye sources? And all this before I reached my goal: Dermocybes! The satiny finish! The scarlet gills! The siren song! Irresistible. I’ll admit to a surfeit of Dyer’s Polypore, but this little one was exhibiting such generosity! I’d already cut it back to the ground a couple of weeks earlier, and here it was, creating yet more opportunity, just asking for another chance to give of itself. I couldn’t bear to disappoint it now, could I? That’s all very well, but if you must look for mushrooms, have you never thought about turning your attention to something useful? I’m talking about the ones chefs covet, the ones foodies rhapsodize about.